High-intensity workouts are the latest trend in fitness. But what does that actually mean? Working to the point of complete muscle fatigue or until you throw up? Or something a little less intense, but hard enough that you can't talk. One of the most important elements is the intensity of your workout, so it is important to get it right. While most guidelines recommend moderate intensity exercise most days of the week, working at a high intensity can help you burn more calories, save time with shorter workouts, and increase your fitness level. The Talk Test - If you're working at a vigorous intensity level, you should be breathless and only able to say a few words at a time. Perceived Exertion - To use this method, match how you feel during your workout to this Perceived Exertion Chart. A high intensity would be around a Level 8-9. Studies have found that perceived exertion ratings closely reflect what your heart rate is doing. This means that if you perceive that your exertion is high, then it is very possible that your heart rate is also high. Percentage of Your Maximum Heart Rate - For this method, you can calculate your target heart rate zone and use a heart rate monitor to track your heart rate. To work at a high intensity, you would stay between 80-90% percent of your maximum heart rate. The 2008 Physical Activity Guidelines suggest doing 5 days of moderate-intensity exercise each week or vigorous/high-intensity exercise for about 20 minutes, 3 days a week, but how much you do is based on your fitness level and goals. It's good to work at a variety of intensity levels to tap into different energy systems and work your body in different ways. Too much high-intensity exercise could lead to burn out or overuse injuries, so you don't want to do this kind of exercise every day. If you're a beginner, starting with interval training is a great way to get your body used to higher intensity exercise, in short, manageable bites. There are ways to work hard while keeping things low impact if jumping isn't comfortable for you. Learn more about how to add intensity to your workouts and get the most out of your workout time. High-intensity interval training (aka HIIT) is where you work, then rest, then work again. HIIT workouts are defined as being done at 90-95% of your maximum heart rate. At this intensity, HIIT can yield what a 20 minute, 2-mile jog would yield. Now, if you do aerobic interval training, say on a treadmill, where you do intervals of 80-90% of your max heart rate for 10 minutes that is the equivalent of a 30-minute steady state workout performed at 75% of your maximum heart rate. 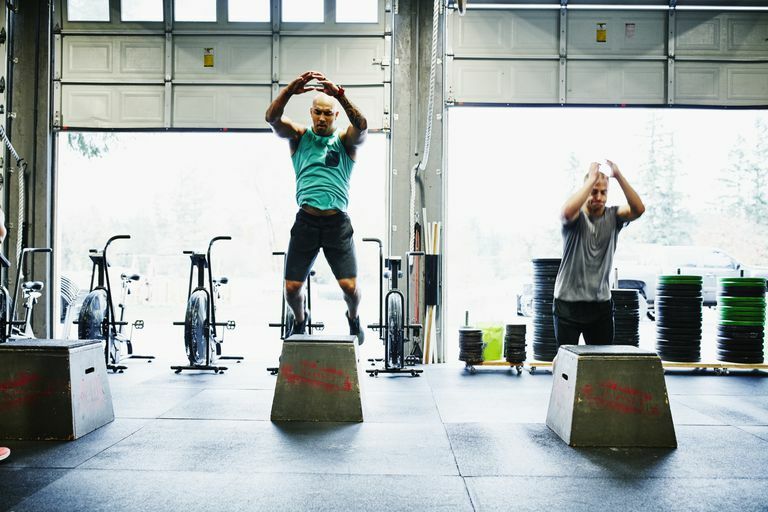 Both are at a high intensity, but HIIT workouts and Tabata-style workouts should be performed at such a high level that the activity cannot be sustained for a long period of time. US Department of Human Health and Services. 2008 Physical Activity Guidelines for Americans.